Climate change and the current drought are having major impacts on Lake Tahoe's health and clarity, according to the annual State of the Lake Report released last Thursday. The report was funded by UC Davis and private donors. 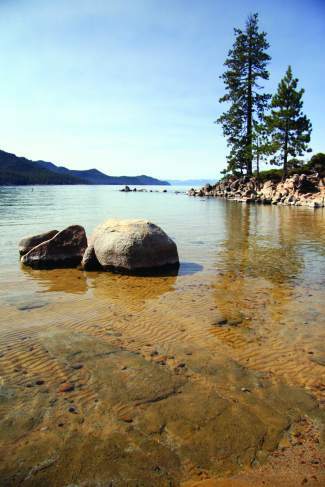 EDITOR’S NOTE: The “Tahoe: State of the Lake Report 2014” was released Thursday morning. Below is a press release issued by the University of California, Davis, recapping what scientists concluded in the report. 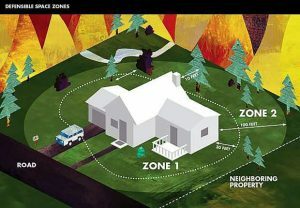 Stay tuned to http://www.tahoedailytribune.com in the coming days for more information and analysis regarding this story. LAKE TAHOE — Lowering a white disk off a boat and into Lake Tahoe’s blue waters was once the most widely used indicator of the lake’s clarity and health. Today, the Secchi disk is still an important tool, but 46 years after the University of California, Davis, first began continuous monitoring of Lake Tahoe, an array of new technologies and computer models are helping scientists better understand what has proven to be a complex ecosystem. These complexities are examined in “Tahoe: State of the Lake Report 2014,” released Thursday morning by the Tahoe Environmental Research Center at UC Davis. The report explains how drought, climate change, and other natural and human factors are driving changes at Lake Tahoe. The report also describes a new real-time network of about 20 monitoring stations — the first six of which are being installed this month — to explore what is causing degradation to Lake Tahoe’s nearshore environment. In collaboration with public and private property owners, the Real-time Nearshore Water Quality Network will gather minute-by-minute data about changing water quality conditions. While the annual average clarity was 5 feet less than the previous year, this decline was mainly due to a wet December in 2012. Summer clarity, the biggest challenge facing Lake Tahoe, was virtually identical to 2012 and improved by over 13 feet from 2011 levels. By combining a half-century of data collection at Lake Tahoe with climate-change forecasts, scientists found that summerlike conditions have been extended at Lake Tahoe. By the end of this century, summer may be two months longer than it was in the 1960s, and maximum temperatures may have risen by 8 degrees Fahrenheit. Winter temperatures were significantly colder than normal in 2013, while summer was warmer. As a consequence, the peak in the timing of snowmelt was again earlier than historical conditions. The July surface water temperature was 65.6 F, the warmest in five years. 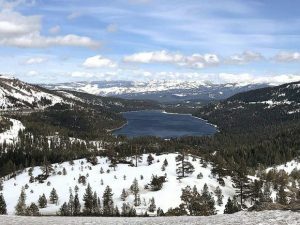 — The 2014 State of the Lake was funded by the California Tahoe Conservancy, UC Davis, and the generosity of supporters who value the role of science to save the lake. TERC partners with other research institutions and with resource agencies in the Tahoe Basin to address the current challenges facing Lake Tahoe.